With this Doll Questions Archive2, we continue questions from visitors and answers provided by Pam, this website Doll.lady. If you are just browsing for any kind of information about dolls, you are most welcome to browse to your heart's content. This Question is from Rick! Thank you for sharing your different variation of Raggy Doodle. I rather like the silk parachute.......more authentic.......than the heavy cloth parachutes on the several Doodles that I have. They look somewhat comic book menacing hanging from the ceiling! This Question is from Kim! My name is Kim, and I have a doll that I think may be a collectible. There was a tag that read, Emily, made of fine china, 1854 Edwin M Knowles, artist by Yolanda Bello, picture perfect babies collection. I hope you can tell me something about this doll. My knowledge of newer porcelain dolls is somewhat limited but will give you a direction in which to search. My favorite online 24-hour doll show has taken over as the determining factor of most doll values. Go to eBay. From the home page, go to "Dolls & Bears"......then type Yolanda Bello into the search at the top of the page. To narrow search.....type in "Emily." On the left side of pages.......you will see "completed items." Also, search these to help determine the price she sold for. If you do not find matches the first time ..........check back often.........as there are new listings daily.......sometimes hourly. This Question is from Linda! My question is what is the value of an old doll with hinged joints and teeth? These dolls should be at least 75 years old. One has a leather body, and I understand that adds value. Where should I look for markings on it? Hi.........look on the back of the head....or on the shoulder plate for markings which will identify doll. The value will be determined based upon the condition of the doll. Value increases if the head is bisque....unglazed porcelain.........with no cracks or chips. Eyes and hair intact. When you have located the mark.........if there is one, you will have a better chance of determining the identity and value. There are hundreds of dolls out there that fall into this description. If you have a photo........that would help tremendously. Could you refer me to the appropriate source for price information on a Bye-lo doll? My sister who lives in Cheyenne, Wyoming has a Bye-lo that she is in need of an appraisal for tax purposes. Can provide description information but at present, I do not have that at my disposal. Any information that you can provide would be much appreciated. There are many doll price guides that will provide you with printed value estimation. These can generally be found in your local library. Or you can go to the ending auctions at ebay.......search for Byelo.......and print off the final ending price of the auction. This will give a reasonable market value of the doll. Byelo is a very popular doll among doll collectors, so it will be easily found in the price guides and on ebay. This Question is from Marlene! 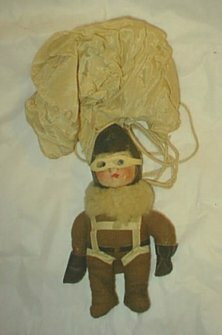 I am Marlene, and I have a General MacArthur composition doll, 18", from 1942 that my Mother left me. I am interested in selling him on eBay and wondered if you would let me know his worth or close to it. I have been looking around to find his worth so that I can ask a fair price for me and whoever is interested. Hi.....I would go to eBay.....then Dolls & Bears.......type General MacArthur into "Search" and click. On the left side of the page......then select "completed items." It will give you the end results of auctions for this doll. eBay pretty well sets the market value any more. Price guides are way over the top. If you don't find anything right away.......just wait a few days. The last one I observed was around 95.00........but condition will determine the final outcome.